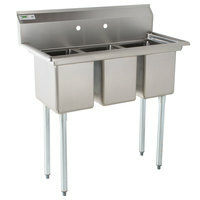 A 3 compartment sink is great for washing, rinsing, and sanitizing in your dishroom or for cleaning food in your kitchen. 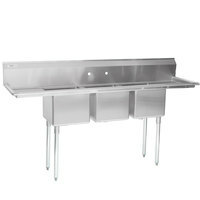 Whether you need a drainboard model or a stainless steel utility basin, we have the right model for you. 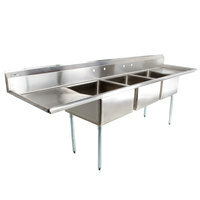 We have a restaurant triple sink for commercial use in a wide range of sizes to suit any amount of space in your kitchen, and many sinks are NSF Listed to meet safety and sanitation standards. 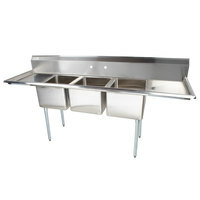 Choose a 3 compartment sink with convenient features like rolled edges to contain splashes, adjustable plastic feet to prevent scratches on your floor, and drilled holes to accommodate faucet installation. 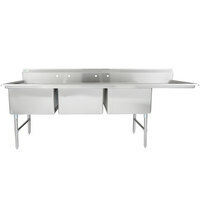 Our sinks are constructed out of sturdy 14, 16, or 18 gauge steel, and in 304 and 430 type stainless steel for light- to heavy-duty use. 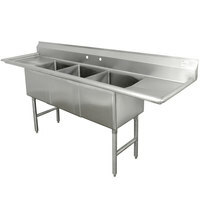 Whether you're using your sink for dishwashing or cleaning produce, we have basins and drainboards in many sizes to suit your needs. 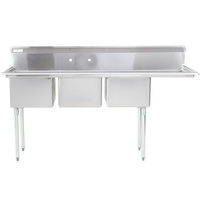 Good - Use this helpful Regency compartment sink to complete your daily washing tasks. 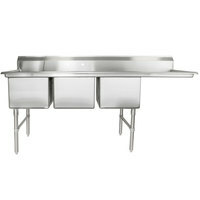 The 12" deep bowl provides plenty of room for washing items, and is mounted on top of sturdy galvanized steel legs. 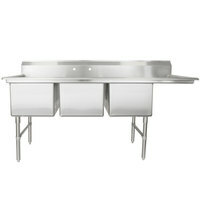 Plus, the plastic bullet feet protect your floor from damage. 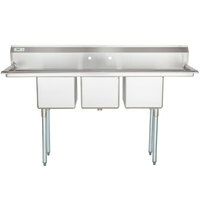 Better - Attack your toughest washing tasks with the help of this Regency compartment sink. 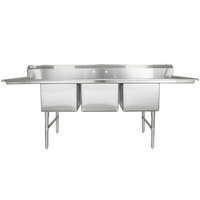 It features a 14" deep bowl so you have an ample amount of room for cleaning a variety of items. 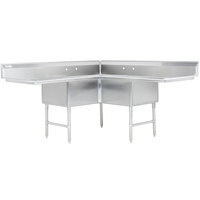 Plus the stainless steel legs and bullet feet are durable, and able to withstand heavy use in your commercial business. 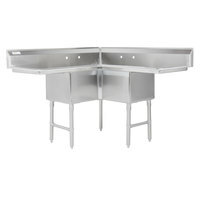 This provides you with longer-lasting use. 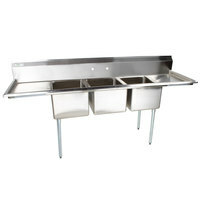 Good - The Advance Tabco 9-3-54-36RL Super Saver 127" three compartment pot sink is made of 18 gauge 304 stainless steel for durability and a professional appearance. 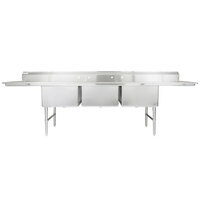 Complete with (3) 12" deep bowls, an 8" backsplash, and (2) 36" drainboards, this pot sink features welded stainless steel cross-bracing on the sides for stability. 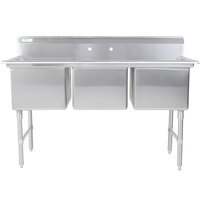 Advance Tabco 93-3-54-36RL Regaline Three Compartment Stainless Steel Sink with Two Drainboards - 127"
Better - The Advance Tabco 93-3-54-36RL Regaline 127" three compartment pot sink is made of 16 gauge 304 stainless steel for increased durability and a professional appearance. 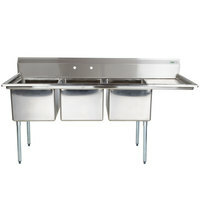 Complete with (3) 12" deep bowls, an 8" backsplash, and (2) 36" drainboards, this pot sink features welded stainless steel cross-bracing on the sides for stability. 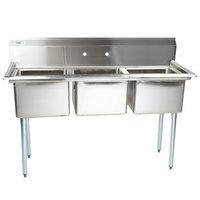 Advance Tabco 94-3-54-36RL Spec Line Three Compartment Pot Sink with Two Drainboards - 127"
Best - The Advance Tabco 94-3-54-36RL Spec-Line 127" three compartment pot sink is made of 14 gauge 304 stainless steel for enhanced durability and a heavy-duty professional appearance. 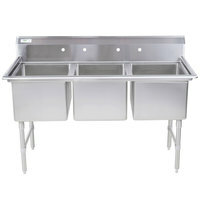 Complete with (3) 14" deep bowls, an 11" backsplash, and (2) 36" drainboards, this pot sink features welded stainless steel cross-bracing on the front, rear, and sides for increased stability. 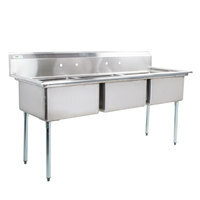 Good - The Advance Tabco 9-43-72-36RL Super Saver 151" three compartment pot sink is made of 18 gauge 304 stainless steel for durability and a professional appearance. 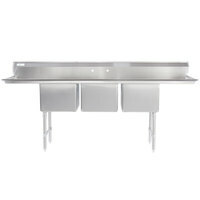 Complete with (3) 12" deep bowls, an 8" backsplash, and (2) 36" drainboards, this pot sink features welded stainless steel cross-bracing on the sides for stability. 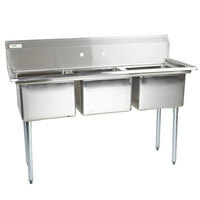 Advance Tabco 93-43-72-36RL Regaline Three Compartment Stainless Steel Sink with Two Drainboards - 151"
Better - The Advance Tabco 93-43-72-36RL Regaline 151" three compartment pot sink is made of 16 gauge 304 stainless steel for increased durability and a professional appearance. 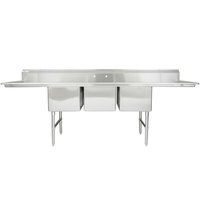 Complete with (3) 12" deep bowls, an 8" backsplash, and (2) 36" drainboards, this pot sink features welded stainless steel cross-bracing on the sides for stability. 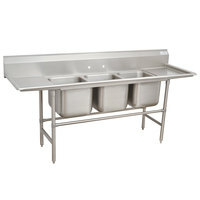 Advance Tabco 94-43-72-36RL Spec Line Three Compartment Pot Sink with Two Drainboards - 151"
Best - The Advance Tabco 94-43-72-36RL Spec-Line 151" three compartment pot sink is made of 14 gauge 304 stainless steel for enhanced durability and a heavy-duty professional appearance. 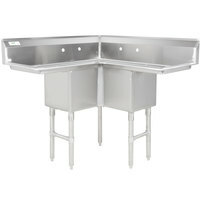 Complete with (3) 14" deep bowls, an 11" backsplash, and (2) 36" drainboards, this pot sink features welded stainless steel cross-bracing on the front, rear, and sides for increased stability. 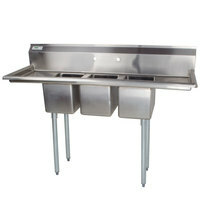 Good - This Advance Tabco fabricated compartment sink is great for dish washing applications! 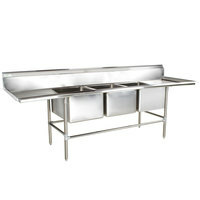 Made of 16 gauge stainless steel, it features welded seams and cross bracing for long-lasting use in commercial settings. 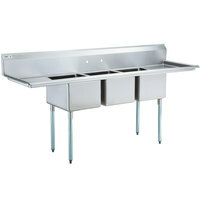 Advance Tabco FS-3-1620-18RL Spec Line Fabricated Three Compartment Pot Sink with Two Drainboards - 84"
Best - Boasting heavy-duty 14 gauge stainless steel construction, this Advance Tabco fabricated pot sink is made to stand up under high-volume commercial use. 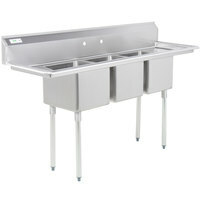 It features a continuous apron design that covers the outside of the bowl and a strong design for outstanding durability!